IT IS a discovery that has shocked Gladstone. The thought of a poor soul's body trapped in a water pipe under the road that so many Gladstone people have driven and walked over for the past week, has been disturbing to say the least. As Alex Mapes said to a friend, "Who would have knew that you were driving past this every day to work?" 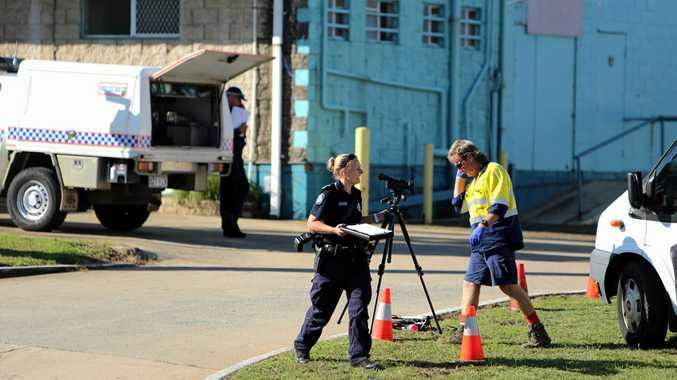 Through social media, the hearts of Gladstone people have not only gone out to whoever it is down there, there has also been an outpouring of sympathy for the council workers who made the discovery. Ben Sanders was one to send condolences to the workers. "That's shocking news," Ben said. "Hope the council workers that found the body are okay. What a horrible thing to find while at work." Amanda-Jane Snell backed this up when she said, "Oh my God, I feel so sorry for the council workers that made the discovery, hope that they are okay." Tracey Nicole added a similar sentiment when she said, "That's terrible, that poor person and workers, what a horrible day for everyone involved." And along with the pure shock, with a flood of sad emojis, there were those that couldn't help wonder who this person is, with plenty of sympathy flowing. "How tragic and sad," Angela Stevenson said. Marnie Ella saw it first hand and was affected. "I drove past the council workers this morning how sad," she said. Melanie McGhie described as "very tragic" while Angela Waller agreed saying "This is so sad". And there was anguish as people tried to comprehend how this happened and how desperately tragic it was. "So sad to think this person has been missing for over a week and this is where they ended up," Melly Cann said. Katie Jackson pleaded with authorities, saying "Oh my God, send someone down to retrieve the body." Perhaps, most succinctly, Haley Reed summed up what everyone is feeling when she posted ... "What the hell?"